Update #8: As the sun is up, we are thankful for God's protection and that He weakened the storm. Please go to IrmaDadeCity.org - please check in with us, even if you have already done so. Please tell your neighbors to check in as well if they need help. We know above all, God gets the glory! Update #7: The wind and outer bands are already arriving. No one venture out this morning. Praying for each of you as the storm passes us in the next 24 hours. NO SERVICES today and office will be closed tomorrow. If have cell service, please call one of the pastors direct for any emergency. We are launching IrmaDadeCity.org - Please share with your neighbors and our community. Current and Past updates from the church. Online Giving to Disaster Relief that will 100% go to help our community recover from Irma. If friends and family want to help - that's a great way to start. Aftermath Help Request. We want to help. This will allow us to know what needs to be done and how to coordinate help efforts in our community. Member Check In. We want our members to check in with us after the storm. Let us know where you are and that you are safe. Update #6: At this time, we feel it is best to cancel all worship services, activities and events on our campus for Sunday. Tomorrow, we will be giving you resources for better communication before/during/after Hurricane Irma. Please keep watch for more information through social media and our website. Update #5: Please be praying for so many of our fellow Floridians who are waiting to see where the Lord allows this storm to make landfall. Our leadership will consult Friday evening and make a decision regarding Sunday services. An announcement will be made here no later than 8:30 PM Friday. Update #4: At this time, we are on a regular Sunday Schedule. Our office is closed on Friday, September 8. We will keep you updated via social media and our website in the coming days. Check back each day for updates. Update #3: We will be closing our office this Friday, September 8 in aligning with Pasco County Schools & Pasco County Emergency Operations. We will update via social media and our website in the coming days. Check back each day for updates. 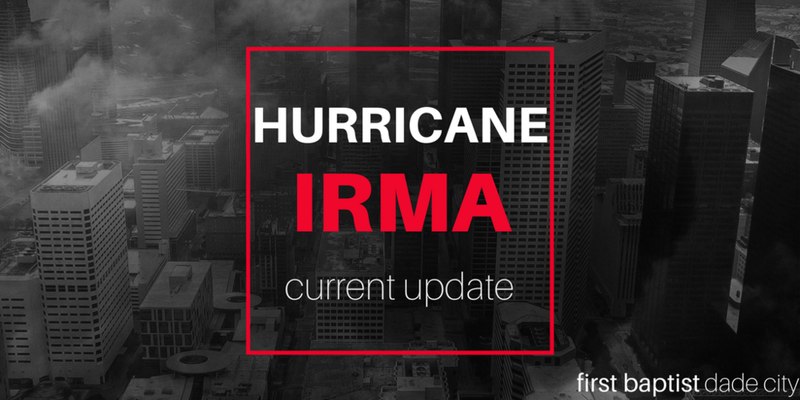 Update #1: We are monitoring the situation with Hurricane Irma and will keep you updated with hours of operation, relief efforts and information as it becomes available. Currently, we are praying for God's protection and His will to be done.